Meanwhile, two Iraqi state-controlled papers, Al-Thawra and Al-Iraq, condemned the Security Council resolution that Iraq accepted Wednesday, with Al-Thawra saying it could be the worst motion on Iraq that the world body had ever passed. The resolution strengthened the mandate of U.N. inspectors charged with searching for weapons of mass destruction in Iraq, giving them unrestricted access to presidential compounds and warning Iraq of "serious consequences" if it obstructs the disarmament process. The United States and Britain have said they will attack Iraq if it breaches the resolution. And, as U.N. weapons inspectors prepare for their return to Iraq, the White House is warning Baghdad not to "play games." In the words of Deputy Press Secretary Scott McClellan, Saddam Hussein "better not go back to his history of cheat and retreat, and deceive and deny, and playing rope-a-dope in the desert." The head of the International Atomic Energy Agency says inspectors won't be sounding the alarm over the odd Iraqi omission or mistake on forbidden programs -- only if there's a pattern of obstruction and deceit. But McClellan says the administration's motto is "zero tolerance" -- and whatever the Security Council may decide, President Bush remains free to react to Iraqi defiance. On the Infinity Radio call-in program, Rumsfeld sidestepped a question on whether the United States would respond with nuclear weapons if Iraq were to use chemical or biological weapons. "The United States government, the president and others, are communicating with people in Iraq, in the military, very forcefully that they ought not to use those weapons," Rumsfeld said. "Anyone in any way connected with weapons of mass destruction and their use will be held accountable, and people who helped avoid that would be advantaged." The weapons inspectors are to resume their search for illegal caches by Dec. 23 and are to report to the Security Council 60 days after they start looking. Iraq has until Dec. 8 to give a full accounting of all its banned weapons programs as well as programs to develop long-range missiles and remote-controlled aircraft to deliver them. 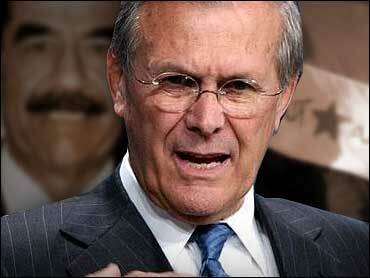 Rumsfeld also told radio listeners it is impossible Iraq does not have weapons of mass destruction. "What it would prove is that the inspections process had been successfully defeated by the Iraqis if they find nothing." The conflict with Iraq is about weapons of mass destruction, Rumsfeld insisted. "It has nothing to do with oil, literally nothing to do with oil. It has nothing to do with the religion." Rumsfeld defended the notion of a pre-emptive strike, saying the world has changed since the Sept. 11 attacks. The danger, the defense secretary warned, is that countries such as Iraq might give terrorist groups weapons of mass destruction, producing imminent threats can't always be seen. "People say 'Where's the smoking gun?' Well, we don't want to see a smoking gun from a weapon of mass destruction," he said. "With a weapon of mass destruction you're not talking about 300 people or 3,000 people being killed, but 30,000 or a hundred thousand." Rumsfeld said the U.S. military at present is capable "to do the job and finish it fast. "There is absolutely no need for the present for us to even think about returning to a draft." The newspaper Al-Iraq defended the government's decision to accept the resolution. Earlier this week, Iraq's parliament, which is packed with pro-government legislators, recommended it be rejected. "Iraq's acceptance of the resolution is an attempt to save our people from any harm. This is the most important thing," Al-Iraq said Friday. Al-Thawra, the organ of the ruling Baath party, said the resolution was "ill-intentioned, unjust and bad resolution." "In fact, it could be the worst resolution ever issued against our country. It represents a breach of the U.N. Charter," the paper said in a front-page editorial. Infinity and CBSNews.com are part of Viacom, Inc.